Me: This is the European box art (minus the title, which should be in that blank patch of sky). You can see it's quite a bit different from the North American box I used in the preface video. It's clearly inspired by the first edition cover of Chaosium's Call of the Cthulhu RPG. So clearly inspired, in fact, that I would wager the reason it was changed for the NA release was to avoid a lawsuit. The first appearance of this picture that I can find is in the November, 1992 issue of Tilt magazine. Prior to that, most articles didn't include anything resembling a potential box, but when they did, it was usually art lifted directly from the Call of the Cthulhu third edition cover. One thing to notice is the Virtual Dreams logo along the top. As I already said, when Alone in the Dark was ejected from the planned Call of the Cthulhu series, it landed in Virtual Dreams. 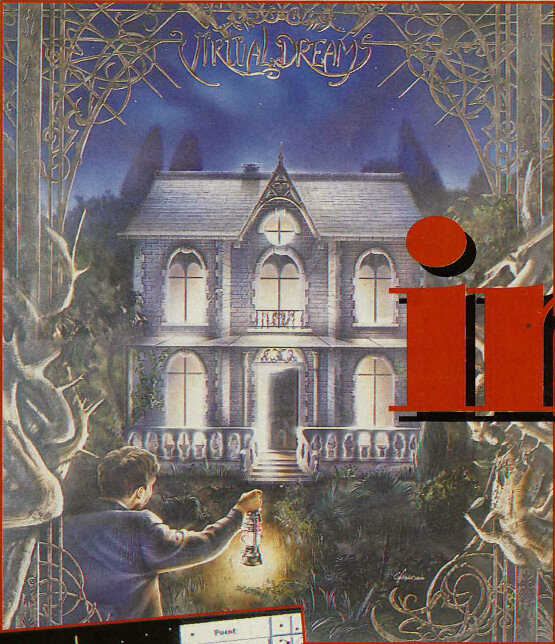 Infogrames announced that it would be a series of 3D adventure games all sharing the Alone in the Dark engine, but the name was quietly dropped and never spoken of again. It is not seen on the NA box or on some of the later European boxes. One of the events from the end of this year is the release of Alone in the Dark, a piece of software published by Infogrames. Consequently, I asked Frédérick Raynal, its creator, to tell us if he was afraid of the dark. We also talked about the game. Moulinex: You put how much time into Alone? Frédérick Raynal: Alone itself, 8 or 9 months, but much more time was put into developing the 3D utility. Mlx: This utility, what is it? 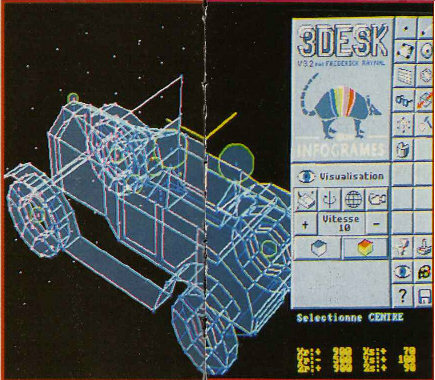 FR: When I programmed Alpha Waves on the PC, I had fun creating a 3D editor. Once the game was finished, Infogrames gave me 1 year to improve it. Mlx: And Alone is the result? FR: Yes and no. In fact, after Aplha Waves, I told myself that it would be interesting to directly animate 3D characters. Very early on, I thought about a game like Alone. While improving the 3D utility, it stayed in my mind and it determined the general direction I went in. Mlx: In the beginning, were you thinking more of an arcade game or an adventure? FR: Both! As for my taste, I am not very into fighting, anyway, I love games that offer an alternative to the player. In Alone, it's possible to avoid a large number of the fights and play like an "adventure" or conversely you can shoot at anything that moves. Mlx: Talk about what moves, exactly. How many character objects are there? FR: Only one! It is the best thing about my 3D utility. A character consists of a single, articulated object, and not polygons connected by pivot points like is usually the case. This avoids the gangly apperance one sees in computer generated graphics. Mlx: So basically, the engine only deals with movement? FR: Yes, the main character has 90 movements on file. A time delay is assigned to each change in position. For example, when striking with a sword, the character moves its arm, the program "looks" at how much time is left before finishing and adjusts the frame of animation accordingly. Mlx: That's why the speed is virtually the same on all machines! FR: Exactly! Simply put, the faster the machine, the greater the number of intermediate movements; thus, smoother animation. FR: There too, it follows from the same principle: when the character walks, the software calculates the intermediates between 4 types of positions. Now, if one gives it the order to turn, the software will calculate the intermediate positions necessary to transition from the last "walk" frame to the first "rotate" frame. Consequently, it allows for some very realistic movements. I myself was amazed at what the character could do at times! Me: I believe Moulinex was actually talking about the idle animation -- at this time, most characters just stood stock-still when they weren't actively doing something -- but this is a more interesting topic. FR: A simple thing to observe during the sword fights. If one chains a side strike and a top-down strike, the character begins the second move with both hands over one side of the shoulder; in contrast, if the order is given when the character has both hands in line with its body, it raises both hands behind its head! Mlx: Have you got any other examples like that? FR: I remember in the first pre-release versions, certain monsters attacked objects. Fortunately, in the final version, they are no longer able to do that. On the other hand, they do some funny things; normally, the monsters attack one on one, but if one runs away and a another monster arises, sometimes they meet up and they begin slapping each other! Me: Have you forgotten the gargoyles, Fred? Their whole aim is to break the mirrors. Maybe he meant there used to be monsters that could attack objects not on your person. Mlx: It's multitasking, in short. How does the software find the time to display the scenery? FR: Except for doors and furnature that can be moved, the scenery is a standard, drawn by hand image. The house, as a 3D object, exists in memory only as a wireframe. With each angle, an image of that part of the structure is shown on the screen. This is why one sometimes finds a monster at an unexpected moment since, in memory, the doors don't exist, which permits them to quietly move from one room to another when they are not on screen. Me: That... that isn't true. Monsters are very much constrained by doors, even when not on screen. It's easy to see this for yourself with the child zombie or bird monster on the third floor. Mlx: Apropos of camera angle changes, how did you go about that? FR: During the development of Alone, we used a wireframe version that allowed us to freely move around the house. Whenever a team member found a nice angle, he saved it. In the end, we kept the best ones. Mlx: Is it important, this notion of a team? FR: Yes, for in this game, everyone has really given their input and the result does not represent a compromise. It is rather a synergy. Mlx: What sort of input? FR: For example, the musician found a great way to make the sounds more realistic: when the character walks, the same sample is played but the trick was to add a small, random offset to the frequencies. Me: That's true, but you're selling yourself short, Fred. Each footstep has two samples, one for right and one for left, but more than that, there are different pairs of samples used depending on the floor surface. Footsteps on gravel, carpet, wood, and stone/tile all sound different. To my knowledge, Alone in the Dark was the first video game to incorporate such a realistic footstep mechanic. Mlx: And the screens saved? FR: That goes without saying. Besides, that takes nothing; one copy of a pixel on four of the game screens and that's all there is to it. I like a game to be well polished. I remember some cassette games for the Spectrum I made, as well as the boxes and jackets! Mlx: What sort of software did you make? FR: Robix, on the Exel 100, a CDTV version of Sim City, with Stéphane Baudet, and Pop Corn, on PC, with Christophe Lacaze. Mlx: Oh yeah! The historic bit of freeware, it was a kind of Arkanoid? FR: Yes, we recieved congradulatory letters from all over the world. Having said that, on Pop Corn, I was engaged only in the design and ergonomics of the game. Mlx: And in the future? FR: There will probably be a sequel to Alone and, in any case, other programs of this type. I intend to further improve my 3D utility. I've already finished Maping (textures) and Gouraud smoothing (an algorithm for anti-aliasing). I would like that in furure games, the characters will be even more realistic. In Alone, the heros have 220 faces. Already, the stairway guards use more faces and articulation points, but it is possible to have more and go even further towards realism. We'll talk about that again. Mlx: You can be certain! Me: Nope. Oh, there would be sequels, but no improvement. Not at Infogrames, anyway. After years of working on Alone in the Dark, once it came time for release, Raynal was actually not at all certain how well the game would be received. He's said that, at that point, all he saw were the flaws. It's incredible success came as a surprise. For its sequels, Raynal wanted to push the engine further: higher resolution, greater polygon count, textures, and light and shadow effects. With computing power rapidly advancing, he also wanted to experiment with 3D environments and moving cameras as well. But Bruno Bonnell, president of Infogrames, was adamant. Innovation costs time and money. With Alone in the Dark's popularity, a sequel would sell based on the name alone. It must use the same engine and be produced as quickly and as cheaply as possible. The disagreement would result in Raynal, Barroz, Chanfray, and Plagnol leaving Infogrames. Bonnell himself would head the production of the sequels. Is this Robix game the same Robix 500 that was Raynal's first commercial release? If it is, then I have it. I can't make it work, but I do have it. It's a platformer for the Exelvision EXL 100. I have both a K7 file (the emulator's file format) as well as an audio recording of an actual cassette. The game intends for you to first load a short loading program, then it will load the remainder of the game, giving instructions for when to start and stop the cassette tape player. The emulator does not wish to play along with these rules. The K7 file will load the loader, and the loader will run, but you can progress no further. I can find no way to make the emulator to listen to the audio file. Robix was released in 1986, which is pre-Pop Corn, but again, are Robix and Robix 500 one and the same? The name is different, and it isn't just a case of "Robix" being a short name, "500" is nowhere to be found on the box or in the instructions; and more troubling is the platform. In 1998, Raynal gave an interview to Virtools where he spoke about his early days as a programmer. He did not specify a platform, but he had been speaking about the ZX81 before bringing up Robix 500 and the anecdote about it selling 80 copies and him making the boxes for it himself. 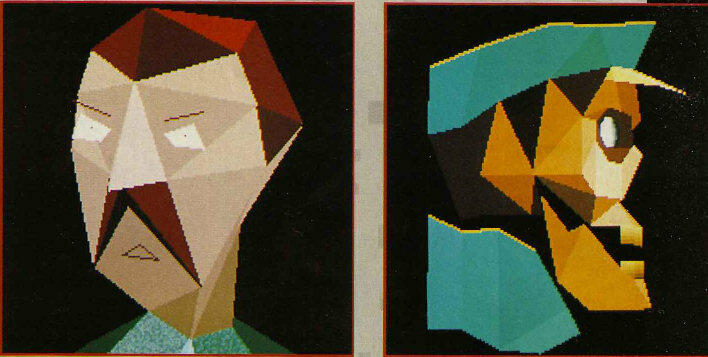 Even here in this article, he mentions the boxes anecdote and says it was for a Spectrum game. The ZX Spectrum was the color follow-up to the black-and-white ZX81. Was Raynal misremembering? Was the game released on multiple platforms with slightly different names? Or is Robix a more polished remake of Robix 500 for a more powerful system?